What’s on the table this summer? One of my favorite ways to start a great meal is to look at the grocery store flyers. This week, for example, I noticed that one of the grocery stores I regularly shop at had both chicken breasts and small soft tortilla shells on sale. 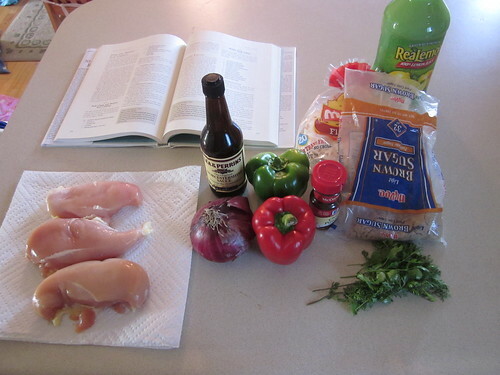 When I see a combination like that, one thing immediately pops into my mind: Chicken fajitas. I love fajitas. They’re full of carmalized vegetables and all sorts of interesting flavors. Plus, they’re not all that hard to cook – all you really need is a skillet and a bowl. The method I use is based loosely on the method described in one of my favorite cookbooks, The Best 30-Minute Recipe. I basically took their “Skillet Steak Fajitas” recipe and started modifying it, adding techniques and flavors I’ve found in other places. 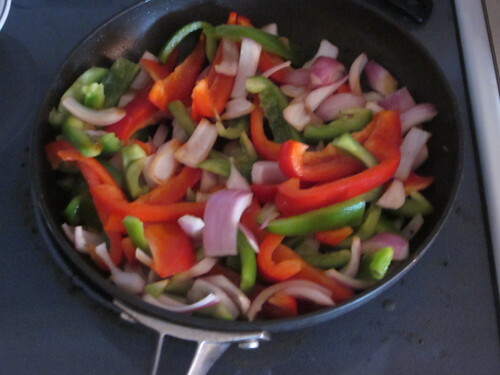 You’ll also need some fajita shells, the number depending on how loaded you make the fajitas. The expensive part of this recipe is the chicken and the fajita shells. Everything else is largely flavoring or fairly inexpensive vegetables. 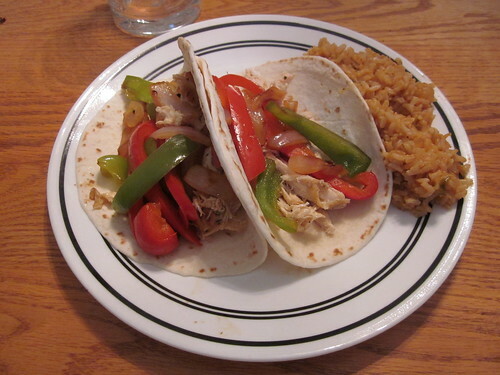 Thus, this is a perfect recipe to make when chicken and fajita shells are on sale. Or, even better – plan ahead a bit and pick up one of them on sale, then wait a while for the other one. 1. 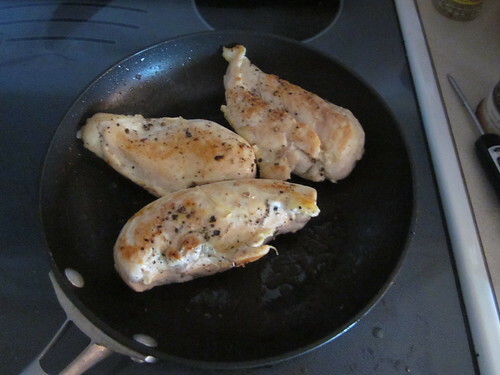 Cook the chicken breasts in a skillet. A few things to notice here. First, I used the vegetable oil in the skillet before I started cooking. This keeps the chicken from sticking to the pan while cooking and helps a bit with the caramelization. Second, I sprinkled some black pepper on the chicken as I cooked it. This is just pure flavor. Also, note the meat thermometer over to the right. If you’re cooking any kind of meat, you need to have a meat thermometer to ensure that it’s well-cooked. 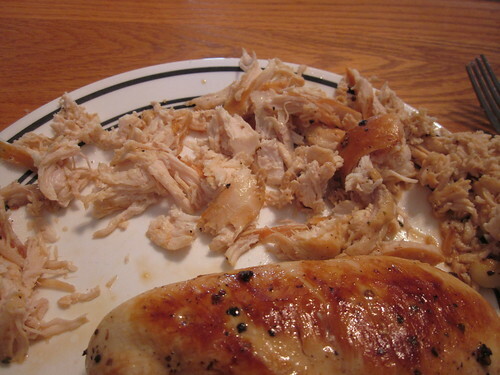 Poultry needs to get to 180 F to kill off any harmful bacteria. I check it regularly while cooking and pull the meat off when it gets above 175 F (the temperature continues to go up a few degrees after you pull it off because the hotter portions on the outside continue to distribute heat to the inside). You can see my copy of The Best 30-Minute Recipe in the background there. The “bookmark” in it is actually a homemade sleeve for my favorite chef’s knife, made out of some spare cardboard and electrical tape. Seriously. Keep the onion pieces fairly large. My pieces may be on the large side of what you’re looking for, but you can easily cut them too small. You want them to brown a bit when cooking – they’ll be delicious. 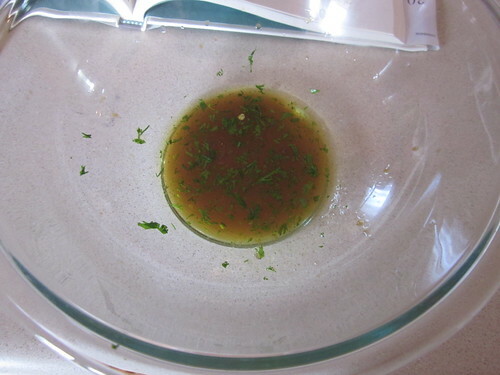 This is just a combination of the remaining ingredients: the olive oil, the chili powder, the juice, the cilantro, the Worcestershire sauce, and the brown sugar. Just put it all in a bowl, mix it around until it looks fairly consistent, and wait. 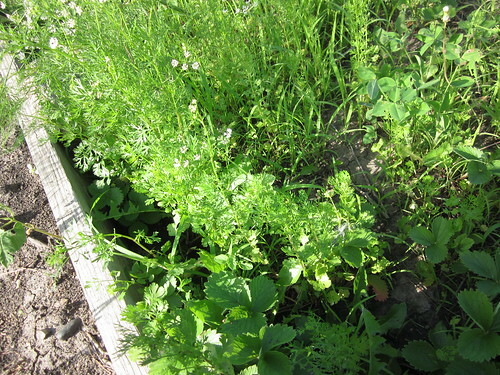 We have a ton of cilantro this year because we had a lot of extra “volunteer” cilantro from last year, far beyond what we expected. Time to make salsa, perhaps? You can just let this plate sit out, or you can put it in the oven at 180 F or so for a while – either one is okay. Just toss ’em all in the skillet together! You’ll want to do this over medium heat. Ideally, the leftover drippings from the chicken helps to brown the vegetables and infuse an amazing flavor into them. 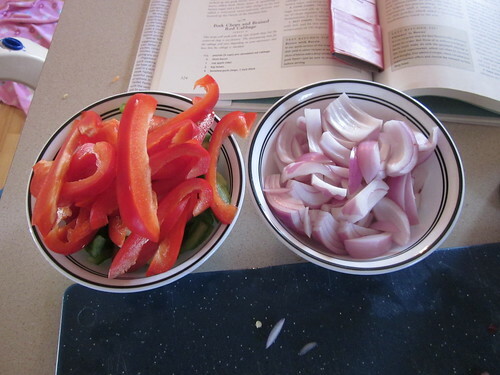 Keep cooking the vegetables and stirring them regularly until the onions start to get nice and brown around the edges. It’s really up to you how long you cook them – just cook them until you’re happy. What I do is use two forks. I use one to hold the breast in place, then I use the other one to tear the chicken to shreds, usually by pulling that second fork through the chicken away from the first fork. It shreds pretty easily. What this leaves you with is chicken with lots of soft tendrils coming off of it. Those tendrils increase the surface area of the chicken – and that’s when magic happens! When the chicken pieces are tossed into the marinade (which is what you do after tearing it up), those soft tendrils absorb and hold that marinade, adding tons of flavor to the chicken. 7. Get your tortillas out, put some meat on them, put some vegetables on them, and eat! What about that “poor man’s” Spanish rice on the side there, though? It’s really easy, too. Just cook a cup of brown rice according to the directions on the rice you purchase. However, replace half a cup of the water with about 3/4 of a cup of salsa (whatever you happen to have on hand works) before you even start cooking it. Cook the rice, fluff, and serve. If you’d like, of course, you could just eat the rice with the fajita ingredients on top and skip the tortillas entirely (which is essentially what my son did). The batch above made enough for two adults and two children for dinner, two adults for lunch the following day, and two adults for lunch a later day (the remnants were frozen). Our cost per meal wound up being less thn a dollar. Yes, that plate above cost less than $1 worth of ingredients. That’s cheap, tasty, and healthy. And pretty easy, too.